The dark days of our winter season start right after Thanksgiving. It’s one of those times of year when it seems that a switch has been flicked. Early September, around Labor Day, is another time, when the season changes from hot and humid to cool and clear. With local free-range turkey and stock made from the Thanksgiving carcass, some local Portobello and dried mushrooms, and local onions and carrots, I set out to make a flavorful soup. All I needed was some wild rice but all I had was some black (“forbidden”) rice from China. Since I was cleaning out the pantry, into the pot it went. Served with a sprinkling of cilantro from the local organic farm, we were set for a very flavorful meal. Impossible to render photographically, at least in our rush to eat, this was a delicious concoction, rich in texture and flavor, meaty but light, deeply satisfying, totally impromptu in the making but worthwhile to remember. For those participating in the Dark Days Challenge, this is not my post… not with that rice! I couldn’t resist naming the soup Dark Days based on its looks, and its seasonal essence. Saute the onion and carrot slowly in the olive oil, add the Portobello mushrooms and continue to cook until slightly soft and lightly browned. Add the broth and bring to a boil. Add the dried mushrooms and rice and lower the heat to a gentle boil. Cover the pot and cook for about 25 minutes or until the rice is cooked. 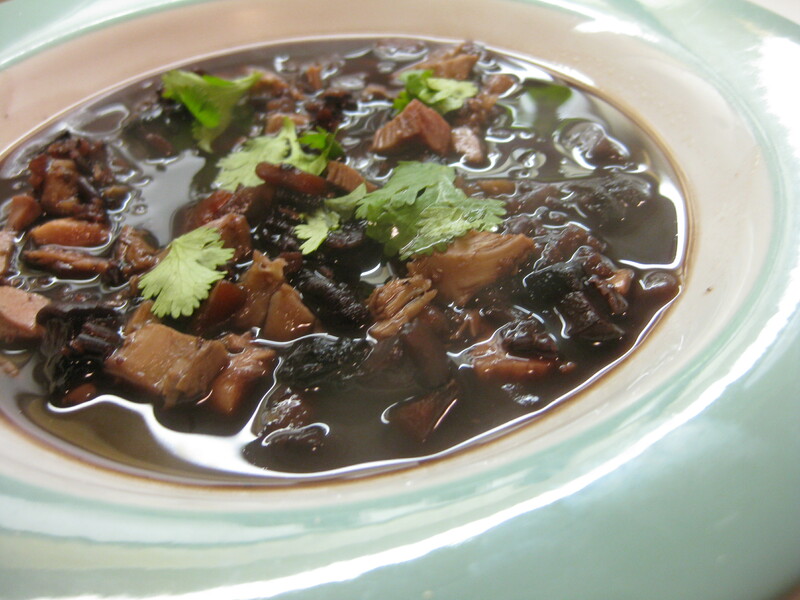 (Wild rice will cook faster than black rice.. Taste and season the broth with salt and pepper. Add the turkey and heat until the turkey is warmed through. Serve garnished with chopped cilantro or parsley.